Following a mixed Sixth Doctor trilogy to begin 2014, Big Finish turns to the Fifth Doctor and Nyssa for a trilogy of their own, taking a break from the more crowded TARDIS of recent years’ stories. Landing in the private hunting grounds of explorer Nathaniel Whitcock in 1911 Suffolk, the Doctor and Nyssa quickly find themselves pursued by a hungry lioness before coming upon Whitcock and his acquaintances who are undertaking a weekend of shooting, becoming ever more embroiled in the mysterious secrets of the Moonflesh and its reputed ability to call down spirits from another realm. Unfortunately, writer Mark Morris has admitted that this story was hurriedly written, and both the characterization of the supporting cast as well as the explanation and motivation of the alien menace suffer as a result. Every actor involved gives a very strong performance, but they are all restricted by the dimensionless and stereotypical restrictions that the script imposes on their characters, wasting fine outings from the likes of Hugh Fraser, Francesca Hunt, John Banks, and Tim Bentinck. They play the aristocratic roles well, but there is nothing even approaching true drama or surprise for anyone involved. The Moonflesh itself is also an interesting concept, though one that is also thoroughly unexplored. An intelligent being that can influence the actions of anything animate or inanimate, Vatoose has the potential to be a very engaging presence, but the fact that Silver Crow is able to somehow defeat it and reduce the seed to harmless rock certainly dampens its potential power. Morris attempts to inject some backstory into the dangerous seed, it being a piece of the Takeler Empire Prime Cluster which was broken apart and scattered, escaping through dimensions and falling into a dormant state to avoid detection and capture, but similar attempts to explain the presence of a strange solo alien have been done much more successfully elsewhere. ‘Moonflesh’ is undoubtedly filled with stunning imagery, and though the sound design is absolutely superb in producing an atmospheric backdrop, but the utter lack of innovation with any other concept keeps the story from successfully achieving what it sets out to do, and the audience’s own imaginations can help a suitably average script only so much. With the parallels between the human hunters and alien assassins left unexplored and obvious allegories kept tantalizingly out of reach, ‘Moonflesh’ misses several opportunities to be something much more interesting than what is ultimately available here, seemingly failing to inspire the typical energy from even Peter Davison and Sarah Sutton as they wade through a story that revels in absolute traditionalism without attempting to do anything new. 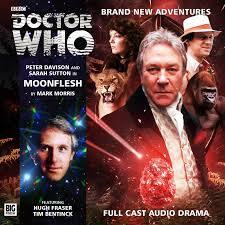 ‘Moonflesh’ is certainly not the worst audio that Big Finish has produced, but in a range that is certainly not firing on all cylinders right now with several strictly average stories having been released in a short time period, its traditional nature is drawn to the forefront even more and does nothing to offer a glimpse of brighter and more innovative times ahead.